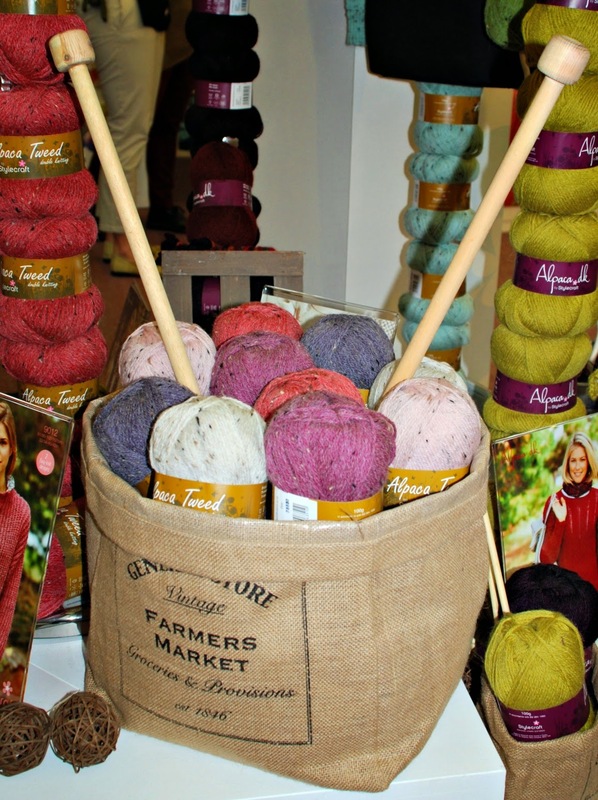 I know it's definitely autumn when I feel that seasonal urge to get my knitting needles out and get busy with some yarn. It's always the same with me: as soon as I feel a nip in the air I want to run for some lovely wool. Emi was complaining recently about how I never knit anything for him. And he was right: I've made precious little for him, my most precious little person. So I set about remedying the situation. 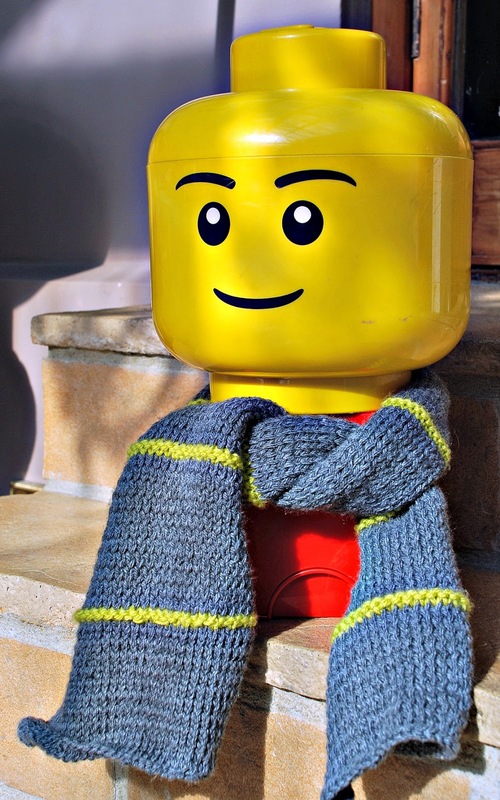 One thing that he needs for the winter is a nice woolly scarf that he can wear when he's not in school uniform. Don't you just love the Lego sculpture that I've put together to model it? I guess I was inspired by Sunday's Art of the Brick Exhibition. In my stash I have a huge amount of Hayfield Bonus Chunky in grey (shade 0786) and lime (shade 0785), so that's what I decided to use. I worked on 5 mm, 80 cm loop, circular needles so that the fabric was nice and dense to keep young Emi's neck warm. I've got a thing about circular needles: I love how I can fold them up and put everything in my handbag, but you can use regular needles if that's more your thing. Cast on 35 stitches in the main colour (grey, in my case) and work 20 rows in stocking stitch (that's knit first and all odd rows and purl second and all even rows). 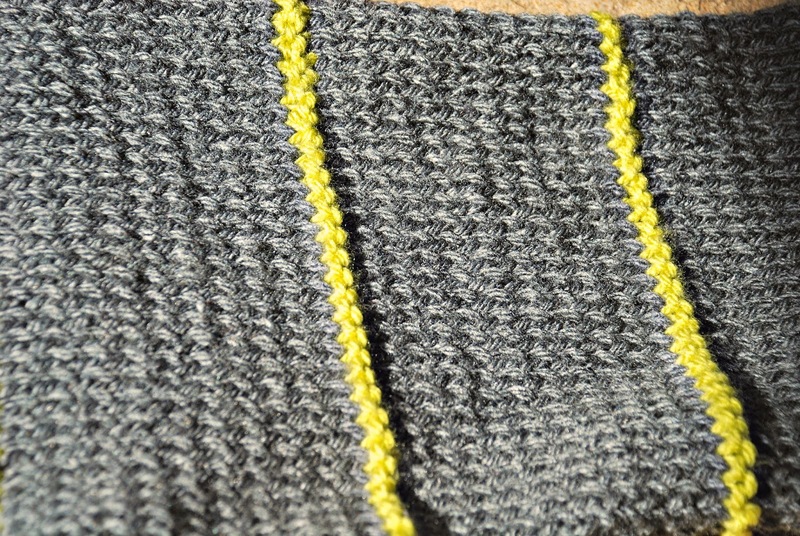 When you get to row 21 knit this row and row 22 using your contrasting colour (the yellow/ lime colour in my case). 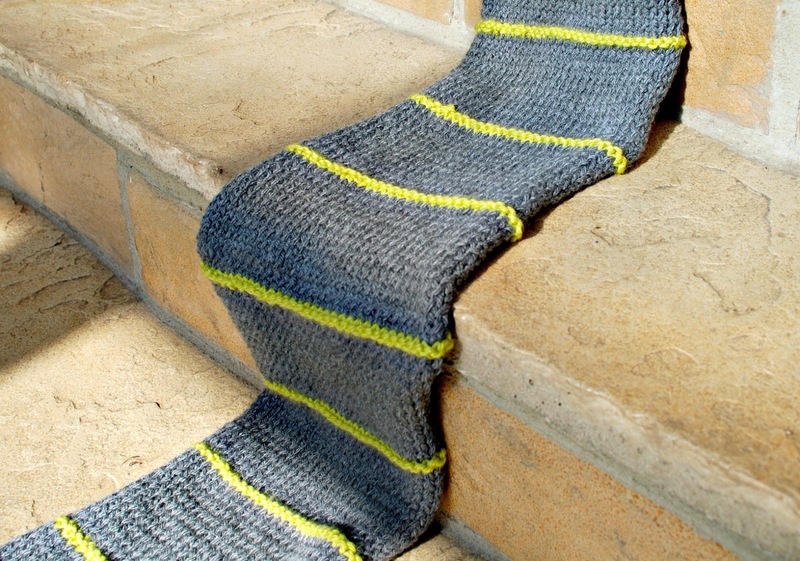 These 2 knit rows provide a contrasting stripe, not just of colour, but also of texture as they form a raised ridge that stands out from the smoother stocking stitch. Now cast on with the main colour (grey) again and do another 20 rows of stocking stitch. 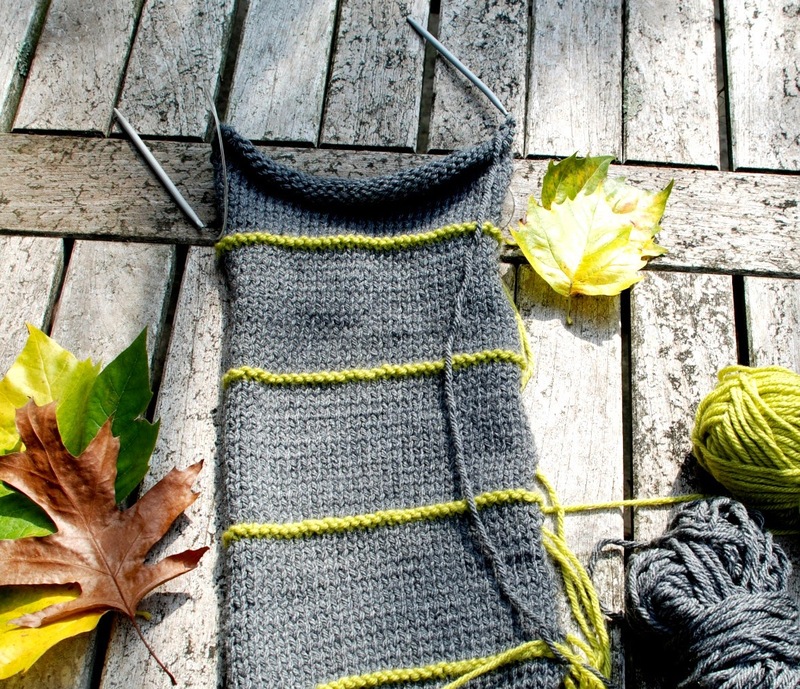 Join with the contrasting (yellow/ lime) colour and do 2 knit rows. 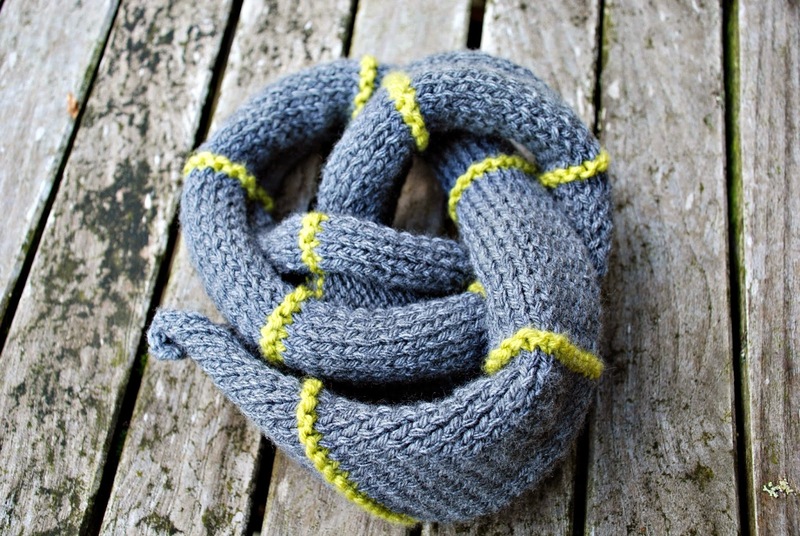 Carry on alternating your colours and your stitches in this way until the scarf has reached the desired length. 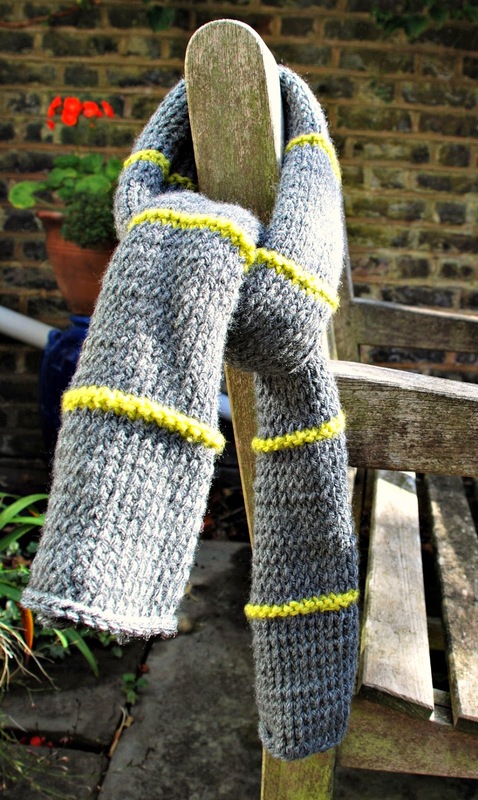 In this case I worked until it was 115 cm/ 45" long, which involved making 10 stripes in the contrasting (yellow/ lime) colour, and ending with a final 20 rows of stocking stitch in the main (grey) colour. Cast off and sew in your loose ends.